I just saw this in my Facebook feed, and now I'm curious if it's actually true. Do they actually keep records of this? It seems improbable, just because there are so many more trans women than senators, but it would be funny if true. A city transgender person was arrested early Wednesday morning after police say she sexually assaulted a teenage boy at Stamford Town Center in April. Senator Craig on the other hand plead guilty to "disorderly conduct", which is not a sexual offense. He allegedly extended his foot and part of his hand into an adjacent stall when using the restroom. But even if you consider what Senator Craig did "sexual misconduct", the statement in the OP is still false. Stephen Wiszak, 24, of 312 E. 12th St., Manhattan, was arrested last night on a charge of felonious assault at 101 Allen St., Manhattan, where he had been pursued by a crowd. Garbed as a woman, wearing an expensive seal coat, Wiszak is alleged to have beaten an unidentified woman with a revolver In the women's rest room of the Rivington st. station. of the 2d ave. elevated rd. Detectives Schneider and Sargeant Brough of the 5th st. station, who captured Wiszak, questioned him In connection with the murder of Mrs. E. Weigand, whose body was found in the washroom of the City Hall station of the B. M. T. on Aug. 5, 1927. A woman told John Dougherty, change agent on the northbound platform of the Rivington st. station, that a man dressed as a woman had followed her that into the washroom, bolted the door behind him, tightened a scarf about her heck and when she struggled beat her on the head with a revolver. She struggled so desperately, she told Dougherty, that her assailant released her and fled. Dougherty believed from the woman's actions that she was intoxicated. Going to the street, her appearance attracted a crowd, to which she related the occurrence. When Wiszak appeared on the street the crowd gave chase. Wiszak took refuge in the Allen st. house, where he was captured. ...She had told John Dougherty, ticket agent on the northbound platform, how a "woman" in the washroom had choked her with her own scarf, and beaten her over the head with a revolver barrel. She said her insistent struggles finally won her freedom. Dougherty thought she was drunk. The victim went to the streets and a crowd heard her story. Wiszak came down the stairs and the crowd pursued him - into a hallway. There detectives arrested him. The woman whose story led to the chase had meanwhile vanished. Wiszak, who fought under the name of Young Eddie, was painted and powdered and wore a sealskin coat, black silk turban, blue flowered dress, flesh colored stockings and tan pumps. He said he had no occupation. 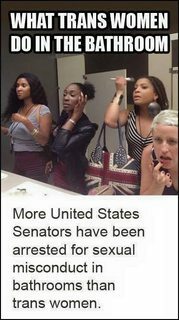 Over the past 15 years there is one documented incident involving a US Senator being arrested for sexual misconduct in a bathroom. Another source responded to this or a similar meme here "Spokespeople from the Transgender Law Center, the Human Rights Campaign and the American Civil Liberties Union told Mic that no statistical evidence of violence exists to warrant this legislation. Vincent Villano, the director of communications for the National Center for Transgender Equality, told Mic in an email that there isn't any firm data to corroborate these lawmakers' claims, and that NCTE has "not heard of a single instance of a transgender person harassing a non-transgender person in a public restroom. Those who claim otherwise have no evidence that this is true and use this notion to prey on the public's stereotypes and fears about transgender people." Not the answer you're looking for? Browse other questions tagged united-states criminology gender . Do predators assault women in female toilets pretending to be transgender? Would the US deficit disappear if the costs of medical activity were more like the rest of the world? Are men naturally inclined to be better at STEM subjects than women?